The tower clock located in China’s Shang Ba He National Forest Park is an example of a contemporary time piece designed and manufactured by Mechanical Watch Supply. These contemporary tower clocks can be incorporated into a wide variety of architectural design elements such as stand-alone towers, office atriums, or landscapes. They are custom built to meet the client’s desired application. 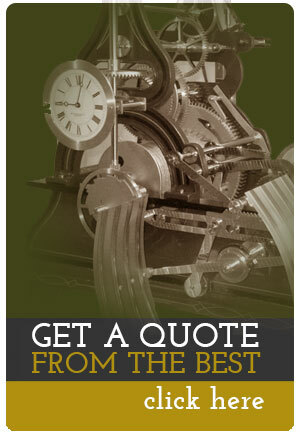 Mechanical Watch Supply manufactures four different sizes of tower clocks to accommodate dials from 1 to 25 feet in diameter. Special requests and additional complications including auto winding mechanisms, temperature compensated pendulums, gravity escapements, calendars, or damaskeening (decorative finish) are available. The Shang Ba He contemporary tower clock is a model #1 designed to drive up to four, six foot dials. 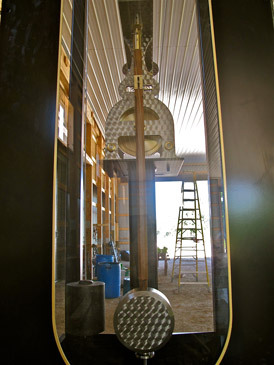 The clock is constructed of stainless steel, brass, and bronze. It incorporates a seconds beating Graham deadbeat escapement as well as a special water driven automatic winding attachment, with manual override. Additionally, the tower clock has a platinum damaskeened finish. 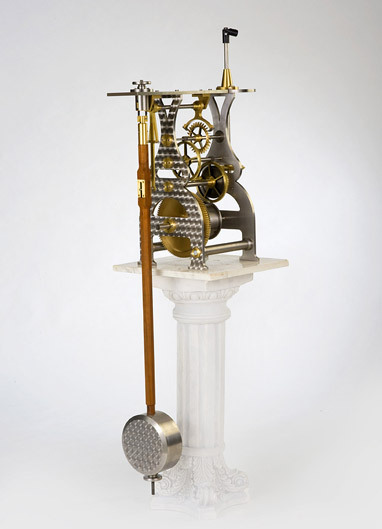 The clock drives four, three foot dials using a central distribution. A unique feature of this clock is its visibility. The clock is mounted on a central pedestal where its operation is viewable by visitors from all sides through glass panels.